Business for sale (guesthouse) in Siem Reap center. Located in the city center near Artisans d'Angkor (developing area), only a 3 minutes-walk to Pub Street, close to the Night Market. Along the main road. 6 rooms : 4 rooms are 20 square meters, 2 others are 45 square meters (with balcony). All rooms are equiped with cable TV, air conditionner, fan, private bathroom, two or three windows, wifi. Hot water provided by solar pannel. Possibility to open a restaurant on the 30 square meters terrace (16 to 18 seats). Behind the kitchen, a space to dry the laundry (express laundry 1kg/1$). 7th bathroom near the kitchen for the staff. Room rates are 12$ to 40$, depending on the season. High occupancy rate. Still 8 years and 2 months lease, untill March 2024. Monthly rental is 600$ now, then 700$ in March 2017, 800$ in March 2020, 900$ in March 2023. Asking price : 17.000 $ (including 2200$ deposit and all furnitures). 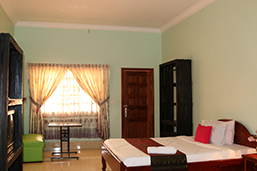 Sale & Rent Location Hotel (4 stars hotel) in Siem Reap. By the road n°6 popular business area. 144 rooms/ 4floors, land size : 6000sqm. Sale of business Hotel with Casino. 100 km from phnompenh. By the road No 1. Total land size: 5 Hectars. Table game: 30. Hotel : 30 rooms. Office : 10. PVP : 3 rooms. Total staffs: 66 people. 12 votes. Average: 2.83 / 5.